We did very little baking growing up. My parents came to this country in the 70s and it seems our kitchen was one of the last places to assimilate. Our pantry was always filled with various Chinese herbs and ingredients and we never really used the oven. On rare occasions, we would bake a cake with the only two things you really need to bake a cake with: cake mix and a bundt pan. 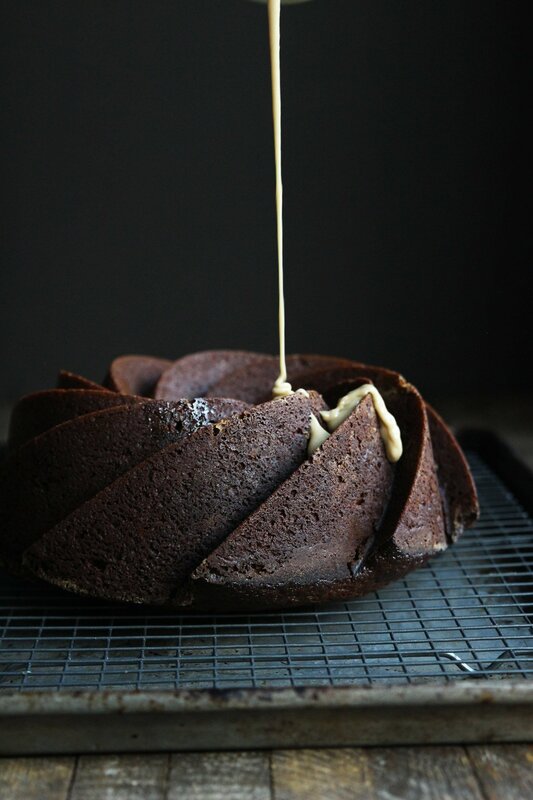 For as long as I can remember, my mom had this red bundt pan and growing up we baked cake after cake after cake with nothing else but that old beat-up bundt pan. It was the only cake pan we had! It served us well and to this day that red bundt pan brings back happy memories for my sister and me of baking together in the kitchen. I’m not sure what happened with that bundt pan, but at some point it must’ve gotten the ol’ heave-ho. 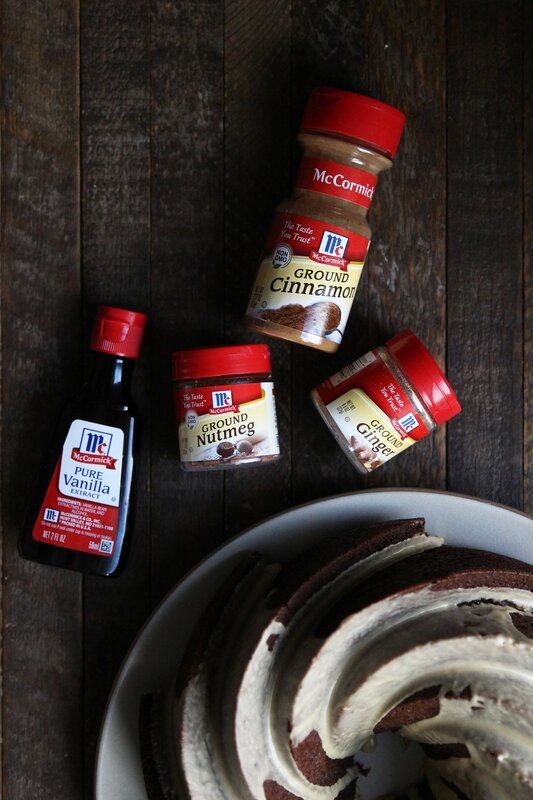 So this holiday season, I’m teaming up with McCormick to rediscover our family’s lost bundt cake tradition by making this gorgeous gingerbread bundt cake. This bundt cake recipe is filled with tons of holiday spices like ground ginger, ground cinnamon, ground nutmeg and ground cloves. 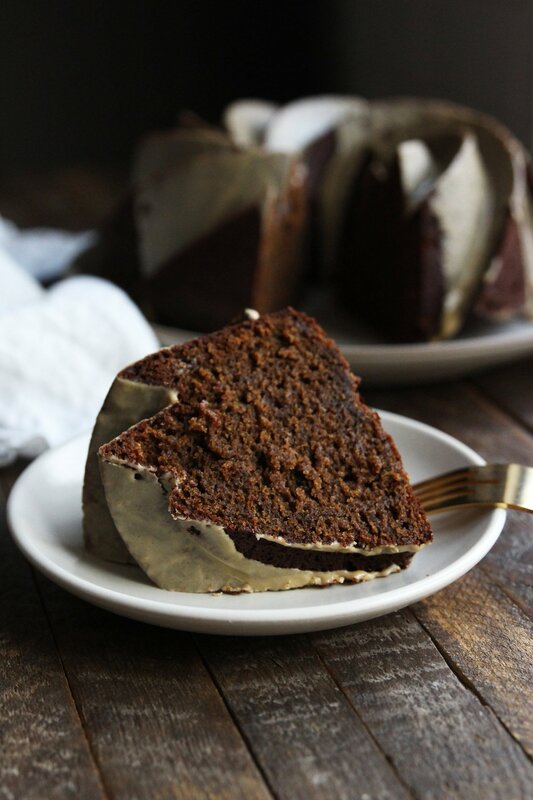 This super moist cake is then covered with the best part of this recipe– a coffee cardamom glaze that is, literally and figuratively, the icing on the cake! 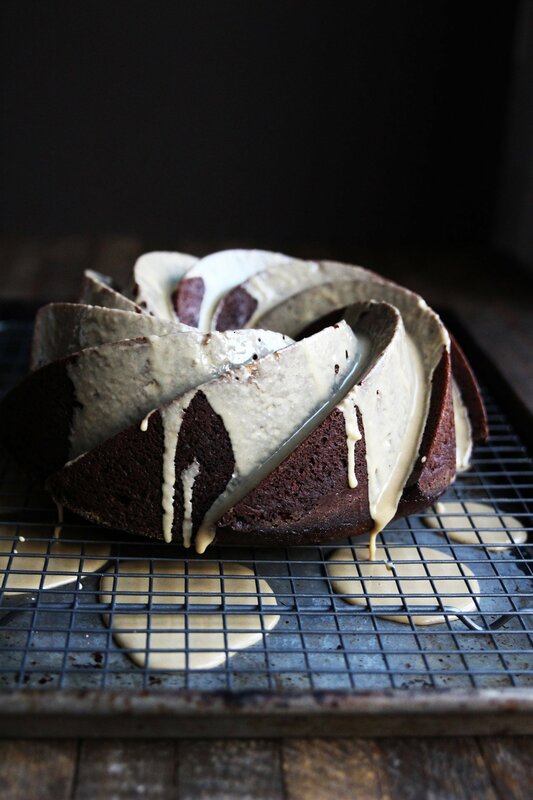 Baking gingerbread from scratch with all the classic holiday spices, like ginger, cinnamon and cloves, is certainly an upgrade to our old childhood bundt cake! In a small bowl, sift the flour, baking powder, baking soda, salt, ginger, cinnamon, nutmeg and cloves. In a larger bowl, whisk eggs, buttermilk, molasses, vanilla extract and vegetable oil together. Add the sugar and mix until combined. Whisk the dry ingredients into the wet ingredients a little at a time and mix until just incorporated. Preheat the oven to 350 degrees. 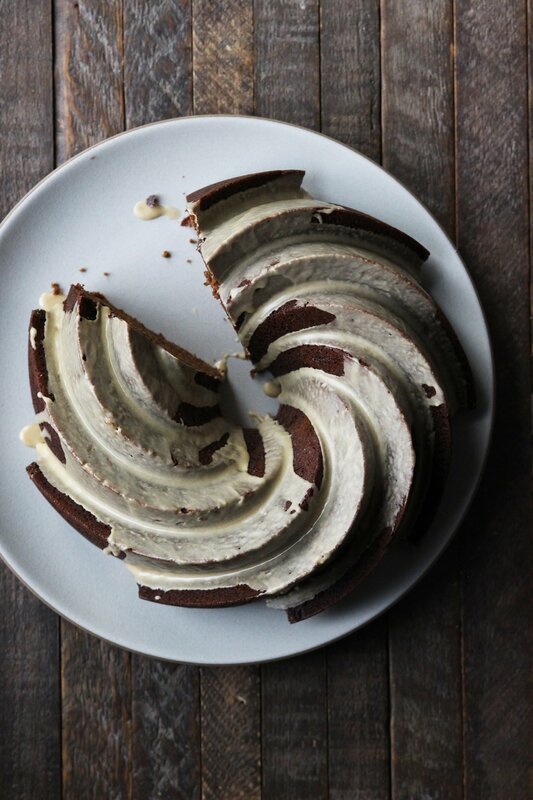 Grease your bundt pan very generously with butter and flour so that every crease is coated. Tap out excess flour. Pour batter into the bundt pan and bake for about 50 minutes or until a toothpick comes out of the center of the cake clean. Allow to cool on a rack until the pan is cool enough to handle and then remove cake and allow to cool completely on a wire rack. Make sure the cake has completely cooled (I let mine cool for over 2 hours). Make the glaze by whisking the powdered sugar, espresso and cardamom together. Pour glaze over the bundt cake and allow to set. 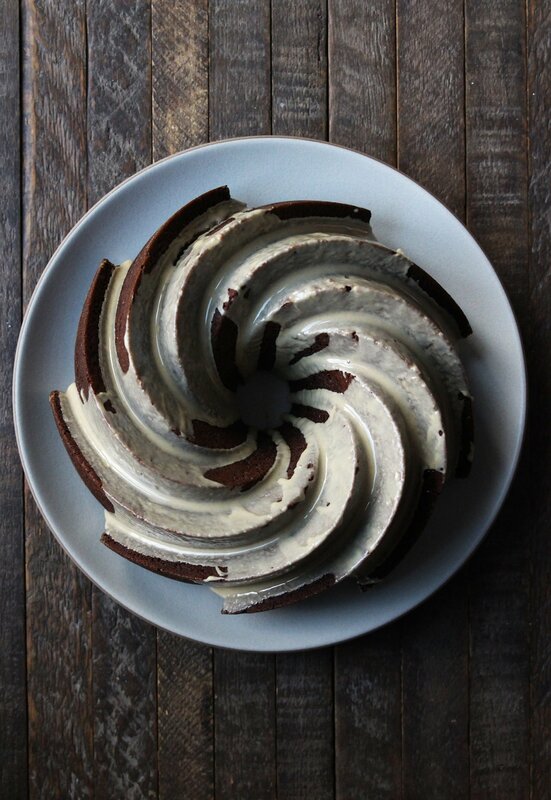 Love the shape of this bundt! Would be curious to know how the shape compares to the old red bundt pan! I love hearing about the red bundt pan. Such fun memories. 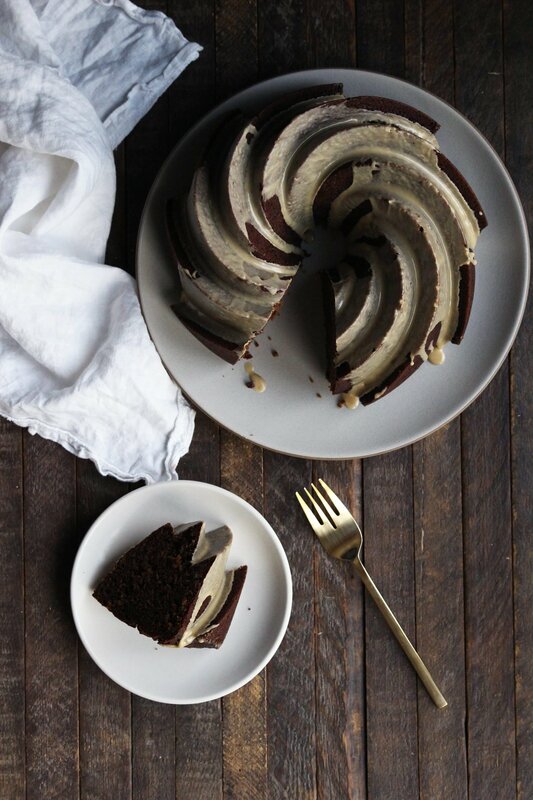 This cake looks and sounds so good. I love gingerbread at this time of year!